This eBook teaches people how to consciously create their reality by provided them an alternate view on how thoughts, beliefs and actions manifest their reality. It provides them profound spiritual tools and advice on how to create a life that better reflects their true inner being, which is one of abundance, joy and love. Purchase through Paypal for only $12.95, download the eBook and start reading right away! Every moment of every day you are consciously or unconsciously creating your reality through your beliefs, attitudes, actions or non-actions. The world you perceive is merely a projection of your being, not an accidental byproduct of random events that are beyond your control. Creating Your Reality is just that. It's about discovering who and what you really are and using new tools and beliefs to help guide you to the life you are capable of creating, no matter how amazing it might seem to you initially. Come explore yourself and release the miracle creator that lies within. Read the introduction or a sample chapter. If you prefer physical books, you can get the paperback version with lulu.com for only $19.97! 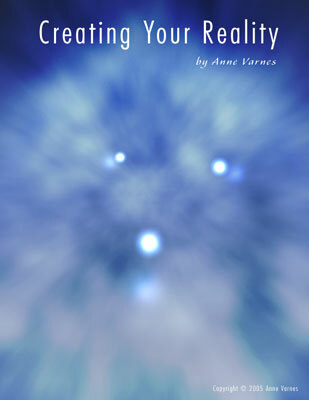 About the author: Anne Varnes is the creator of the famous web site about astral projection, astralvoyage.com, and author of other popular paranormal and spiritual sites such as: yourghoststories.com, psychic-experiences.com and spiritual-experiences.com. Her challenging life story and unique psychic talents have helped her uncover untapped potential, which is present in everyone, and leads to a more abundant and satisfying life.